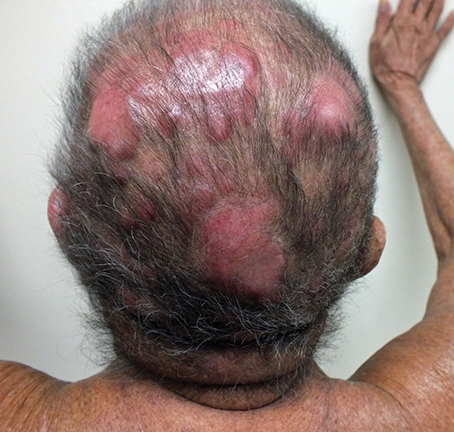 An 82-year-old woman with extensive cutaneous lesions involving the face and torso from a T-cell lymphoma, stage IV, was seen for consideration of palliative radiation therapy to the skin lesions. Her chief complaint was intense pruritus. 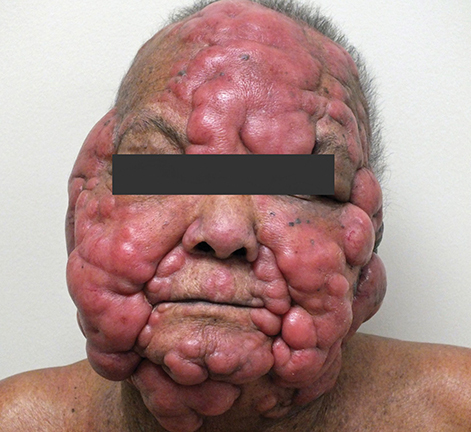 The skin lesions progressed rapidly within a few months to more confluent 3 to 4-cm tumor and plaque lesions causing facial disfigurement (Figures 1A-B). In addition, multiple tumor nodules were noted in bilateral axillae, groins, lateral flanks and lower extremities. She had small adenopathy in the axillae and groins. Her medical history included gout, hypertension, dyslipidemia and arthritis. Her hemoglobin was 13g/dL, white blood count was 33500/μL and lymphocyte count was 20500/μL. A blood chemistry profile showed elevated creatinine-2.02mg/dL, urate-13.2mg/dL and LDH-538 IU/L. HTLV-1 and HTLV-2 serology was negative. Peripheral blood flow cytometry showed abnormal T-cell population. Bone marrow aspirate and biopsy were positive for CD3 and CD4, negative for CD26 and TDT. The marrow cytogenetics was normal. CT scans of the chest, abdomen and pelvis showed small volume adenopathy in the axillae. The skin biopsies demonstrated T-cell lymphoproliferative disorder with the atypical infiltrate positive for CD3, CD5, CD25 and CD30. Few cells were positive for CD20. There was no expression of CD26, CD56 and CD57. 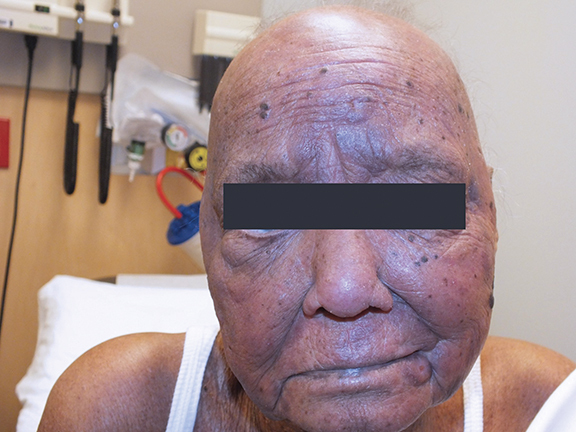 There was no evidence of lymphoepidermotropism that is typical of cutaneous T-cell lymphoma. The differential was peripheral T-cell lymphoma, adult T-cell leukemia/lymphoma and sezary syndrome. The patient was initially treated with chlorambucil, etoposide and dexamethasone, but the response was transient. Given her age and performance status, she was not a candidate for aggressive chemotherapy. She was referred to radiation oncology for palliative radiation to her skin lesions. 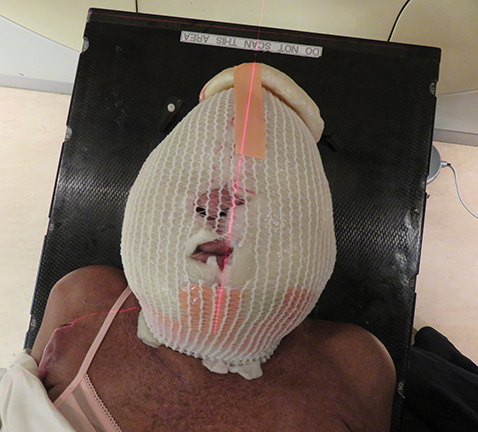 The radiation therapy team was faced with technical challenges in treating the multiple confluent skin lesions with variable sizes interposed with crevices involving the entire facial skin and scalp in a circumferential fashion. 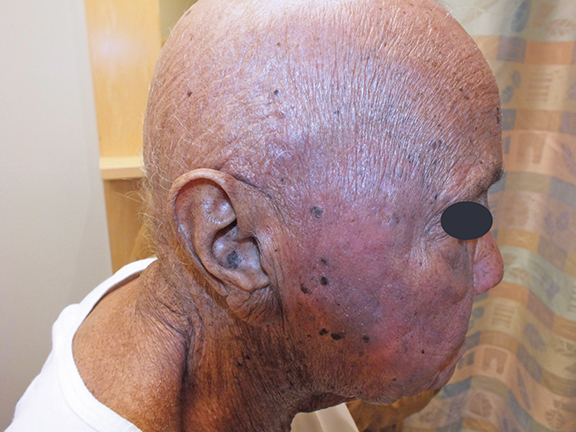 Mycosis fungoides (MF) and its variants represent the most common form of cutaneous T-cell lymphomas.1 The malignant cell is derived from a post-thymic T-cell that typically bears a CD4+ helper/memory antigen profile. The disease is characterized by erythematous patches in sun-protected areas that progress to plaques and tumors. Pathology from a skin lesion typically shows lymphoepidermotropism, which is absent in our patient. 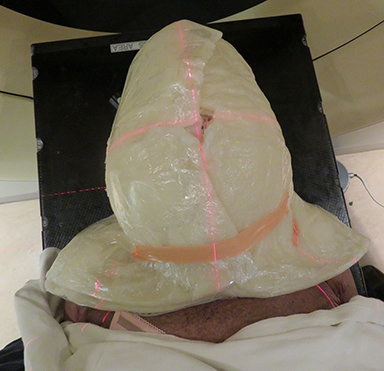 Hence, the team chose the volumetric-modulated arc therapy (VMAT) technique with 6 MV photons to decrease the thickness of the most symptomatic skin lesions in the head and neck area prior to considering total skin electron-beam therapy. 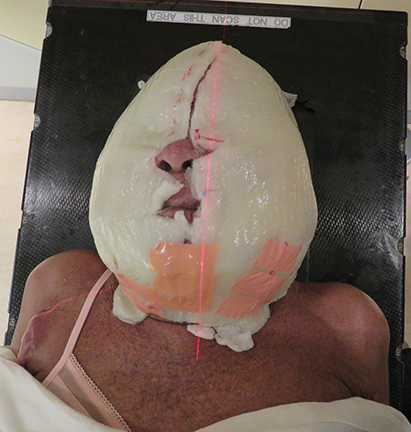 The patient underwent a radiation treatment planning process that included an Aquaplast (Qfix, Avondale, Pennsylvania) mask with bolus covering the entire skin over the head and neck areas (Figures 2A-F). Subsequently, CT simulator images were acquired for treatment planning. 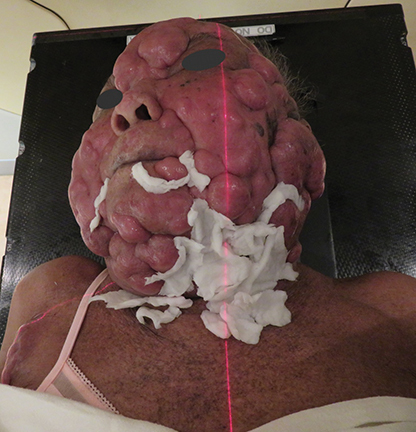 The entire scalp, facial skin and the skin of the neck including tumors were contoured as clinical target volume (CTV). A variable expansion of 8 mm out and 5 mm in was applied to the CTV to create a planning target volume (PTV). An optimized PTV was then delineated after carving out eyes and adding a 3-mm margin around the brain for planning organ at risk volume (PRV). 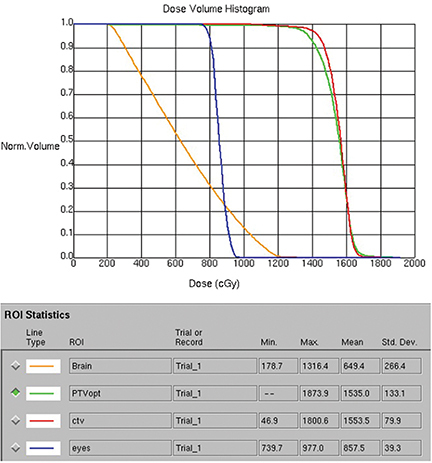 A 2-arc 6 MV VMAT-optimized plan was generated.3 A total dose of 15 Gy in 10 fractions with a low dose per fraction was chosen due to high tumor radiosensitivity and to minimize acute and late side effects. A low total dose would also allow for the use of total skin electron-beam therapy later if needed. Organs at risk dose constraints—especially for brain, eyes and lips—were met as shown in the dose volume histograms (Figures 3A-C). Daily treatment setup took approximately 30 minutes. Wet gauze was used to fill the gaps on the skin surface to achieve a uniform thickness prior to placing the custom-made layers of Vaseline-impregnated gauze built up to a thickness of 0.5-cm bolus, then secured with Surgilast (Derma Sciences, Princeton, New Jersey). 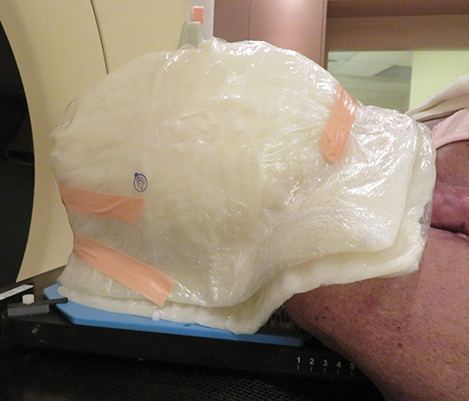 After a 1-cm bolus on the vertex was taped, the patient was immobilized with an Aquaplast cast. Finally, another 1-cm bolus was placed on the cast. Image-guided radiation therapy using daily cone-beam CT matched to bony anatomy and assessed eye position was used to ensure precise alignment of the intended target. 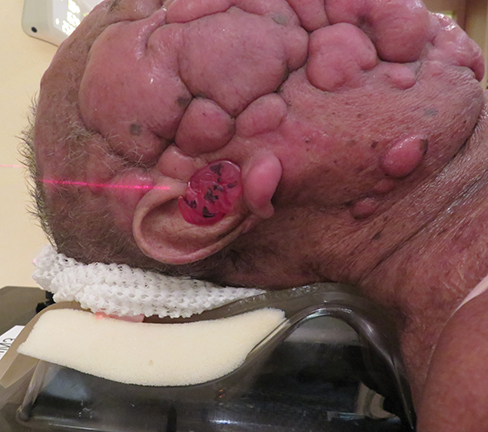 The patient tolerated the treatment extremely well with minimal radiation dermatitis. Six weeks after completing the radiation, she achieved a complete response of the tumors treated (Figures 4A-B). We also noted spontaneous regression of some untreated tumors on the torso, indicating an abscopal effect. Novel VMAT’s rotational approach with photons can be utilized for treating extensive cutaneous disease involving uneven and curving surfaces such as the scalp, head and neck, or torso with the goal of achieving local tumor control and providing excellent palliation with minimal radiation dose to adjacent normal structures. Girardi M, Heald PW, Wilson LD. The pathogenesis of mycosis fungoidis. N Engl J Med. 2004;350:1978-1988. Specht L, Dabaja B, Illidge T, et al. Modern radiation therapy for primary cutaneous lymphomas: field and dose guidelines from the International Lymphoma Radiation Oncology Group. Int J Radiation Oncol Biol Phys.2015;92(1)32-39. Teoh M, Clark CH, Wood K, Whitaker S, Nisbet A. Volumetric modulated arc therapy: A review of current literature and clinical use in practice. Br J Radiol. 2011;84:967-996. Acknowledgements: The authors acknowledge Debra Gallinger, clinical specialist radiation therapist for mycosis fungoides disease site, and Jasmin Vansantvoort, radiation therapist, for their contribution. Muruganandam P, Voruganti SM, Ostapiak O, Shim MG. Extensive cutaneous T-cell lymphoma and challenges with radiation treatment. Appl Rad Oncol. 2017;6(2):29-32. Dr. Muruganandam is a radiation oncology resident and Dr. Voruganti is an associate professor, Department of Radiation Oncology; Dr. Ostapiak and Dr. Shim are medical physicists, Department of Medical Physics, McMaster University, Juravinski Cancer Centre, Hamilton, Ontario, Canada.